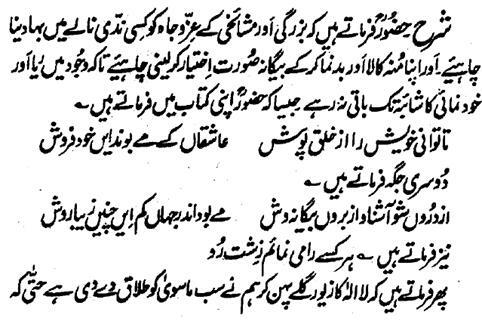 Hazrat Sultan Bahu Rahmatu-Allahe Ta-aala Alaihe says that one should throw the pomp and fame of saintliness and scholarship in a river or stream and he should blacken his face and make it ugly and should wear the attire of the outsider in order to ensure no presence of any traces of Riya and self conceit in him as he says in a book that one should try to keep himself hidden as much as if possible because the Aashiqeen are never Khud-Frosh. At another place, he says that one should remain familiar with the insider and unfamiliar with the outsider because few are in the world that follow this beautiful practice. 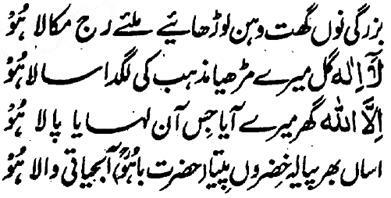 Again he says that 'we have divorced the Dunya (World) wearing the ornament of Laaa-Ilaaha (there is none worthy of worship) in our neck so much so that now there last no desire and longing for the bounties of the Eden in us. Now what concern is ours with that creed with which are pinned the demand and aim of the Garden same as some has said that the People of Uqba are aiming at profit and the Seekers of Dunya (World) are in loss and in this hot business for profit and loss, the spirit gets burned. He, further says that upon our utterance of the words of Il Allah (Except Allah), our Real Lord and our Bridegroom has entered the house which has fulfilled all our longings and hopes and now we, after having illuminated by the Hayyu Qayyum Anwaar of the Essence of our Real beloved , we have become the living till perpetuity like Khizar Alaihis-Salaam .